Blue carbon refers to the carbon sequestered, stored, and released by coastal and marine ecosystems. 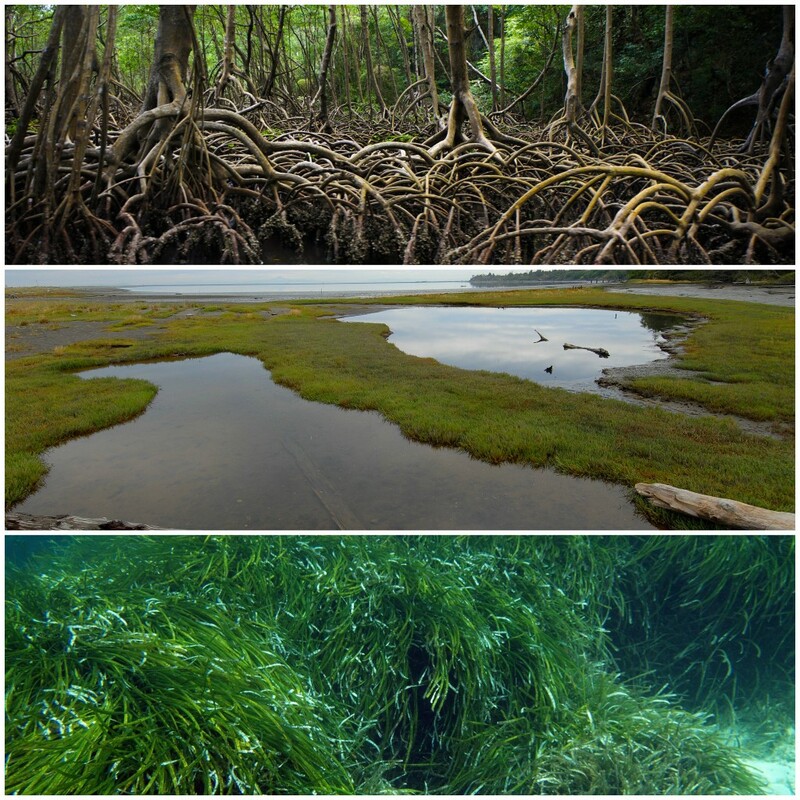 Coastal blue carbon ecosystems (e.g., mangroves, salt marshes, and seagrasses) play a critical role in the sequestration and long-term storage of carbon, thus helping to reduce the impacts of climate change. Blue carbon ecosystems are found along the coasts of every continent except Antarctica. Mangroves grow in the intertidal zone of tropical and subtropical shores, tidal marshes occur on sheltered coastlines from the sub-arctic to the tropics, though mostly in temperate zones, and seagrasses are found in coastal waters of all continents except Antarctica. 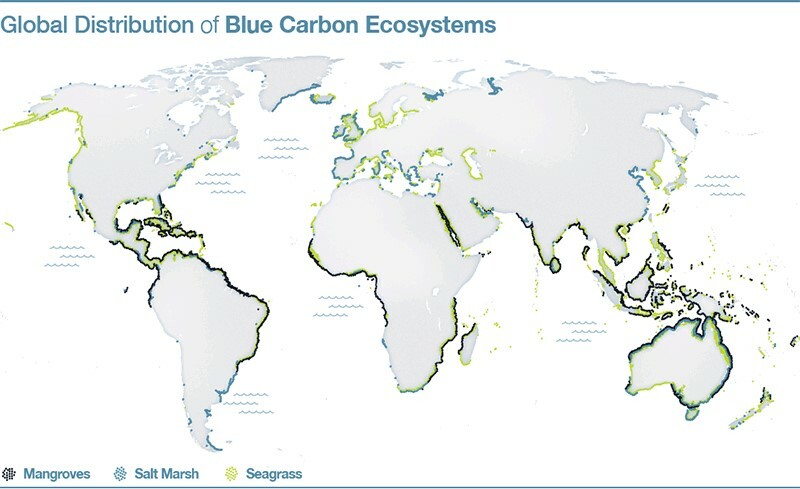 Global Distribution of Blue Carbon Ecosystems; Source: The Blue Carbon Initiative. These ecosystems remove carbon from the atmosphere and oceans, and store it in their leaves, stems, branches, roots as well as the underlying sediments. 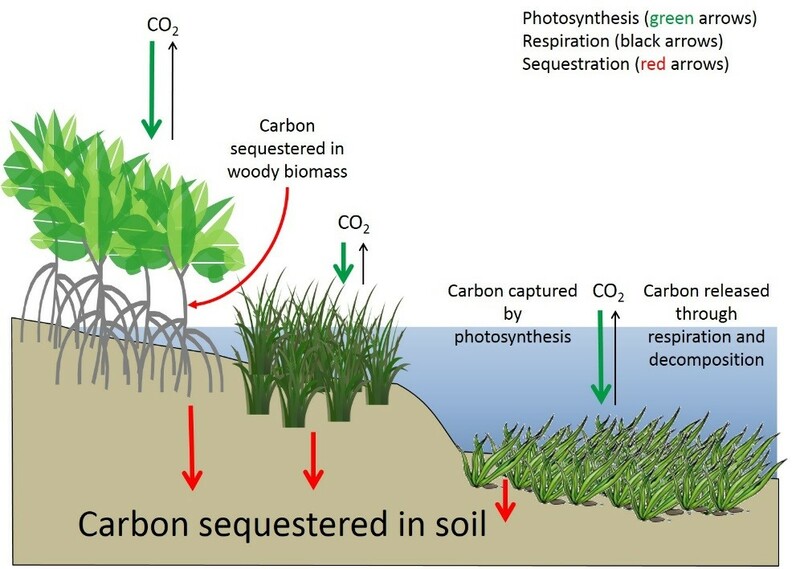 Carbon gets captured via photosynthesis (green arrows) in coastal wetlands where it gets sequestered into woody biomass and soil (red arrows) or respired back into the atmosphere (black arrows). Source: Modified from Howard et al. 2017. On a per area basis, these ecosystems are more efficient carbon sinks than most terrestrial forests (Mcleod et al. 2011; Pan et al. 2011; Figures below). Unlike terrestrial soils, the sediments underlying blue carbon ecosystems are largely anaerobic (without oxygen). Therefore, the carbon in the sediments decomposes very slowly and can be stored for hundreds to thousands of years. ref Additionally, the high salinity in many blue carbon systems limits methane production, a potent GHG. ref Finally, unlike terrestrial and freshwater systems, blue carbon systems do not become saturated with carbon because sediments accrete vertically in response to rising sea level, when ecosystem health is maintained. ref Therefore, the rate of carbon sequestration in sediments and the size of the sediment carbon sink may continue to increase over time. 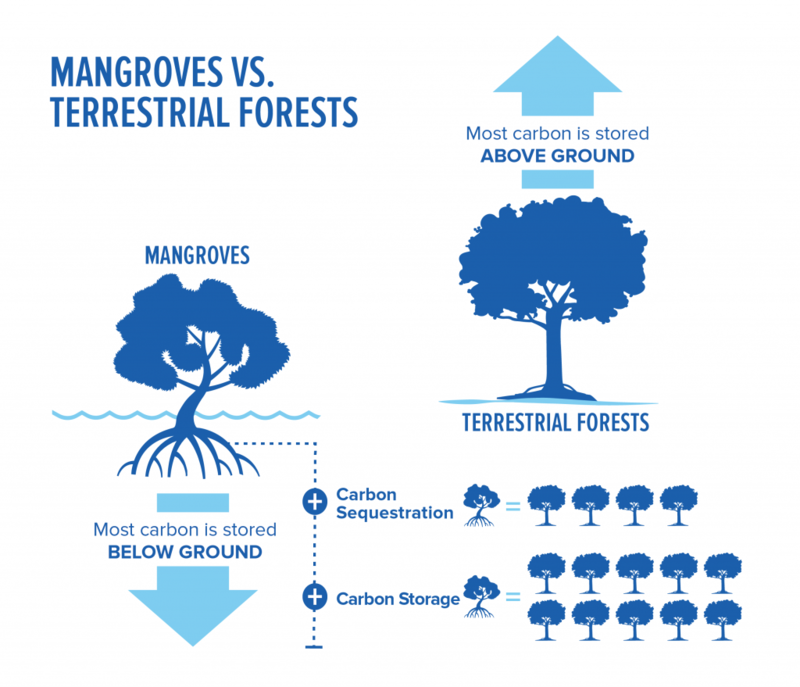 ref Such processes demonstrate the important role that blue carbon ecosystems play in both mitigation (carbon sequestration) and adaptation (vertical accretion in response to sea-level rise; wetlands also reduce wave energy and impacts of sea-level rise and storm surge). Such processes demonstrate the important role that blue carbon ecosystems play in both mitigation (carbon sequestration) and adaptation (vertical accretion in response to sea-level rise; wetlands also reduce wave energy and impacts of sea-level rise and storm surge). Although blue carbon ecosystems represent a much smaller area than terrestrial forests, their total contribution to long-term carbon sequestration is comparable to carbon sinks in terrestrial ecosystem types. Despite the smaller aboveground biomass and areal coverage of blue carbon ecosystems, they have the potential to contribute substantially to long-term carbon sequestration resulting from the higher rate of organic carbon sequestration in sediments. While they are some of the most carbon-rich ecosystems on Earth, they also are highly threatened. Once they are degraded or destroyed, their stored carbon can be released into the atmosphere and ocean and can be a major driver of climate change. ref For example, when wetlands are drained for development, microbial action in the soil, previously inhibited by tidal inundation, oxidizes the carbon and emits it to the atmosphere as CO2. 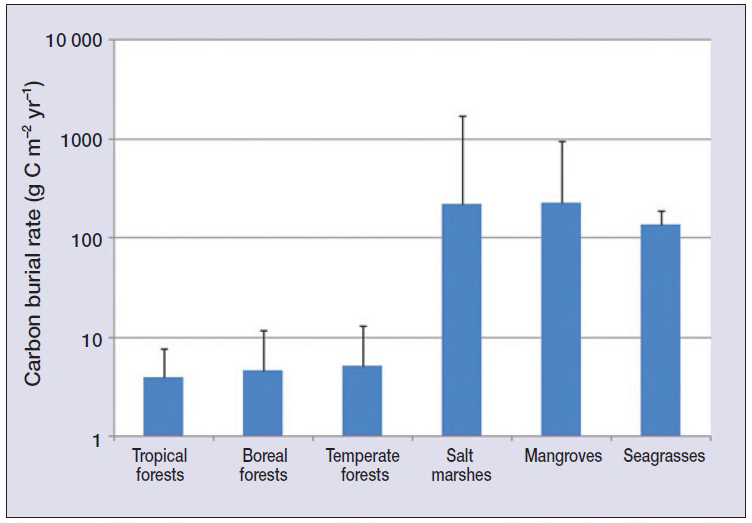 Rates of blue carbon loss range from 0.7 – 7% annually (depending on vegetation type and location), resulting in 0.23-2.25 billion Mg of CO2 released. ref Therefore, the conservation, restoration, and sustainable use of blue carbon ecosystems is essential to ensure that their carbon sequestration benefits are maintained, in addition to the many additional benefits that they provide.